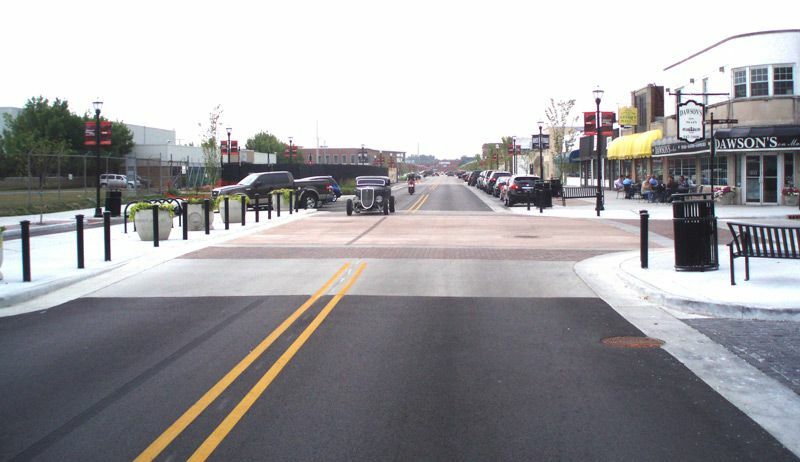 Raised intersections create a safe, slow-speed crossing and public space at minor intersections. Similar to speed humps and other vertical speed control elements, they reinforce slow speeds and encourage motorists to yield to pedestrians at the crosswalk. 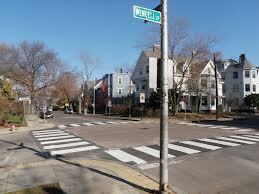 Raised Intersections reinforce slow speeds and encourage motorists to yield to pedestrians at the crosswalk. 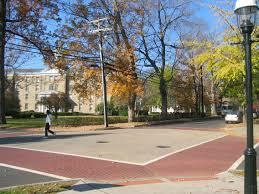 1 Raised intersections are flush with the sidewalk and ensure that drivers traverse the crossing slowly. Crosswalks do not need to be marked unless they are not at grade with the sidewalk. ADA-compliant ramps and detector strips are always required. 2 Bollards along corners keep motorists from crossing into the pedestrian space. 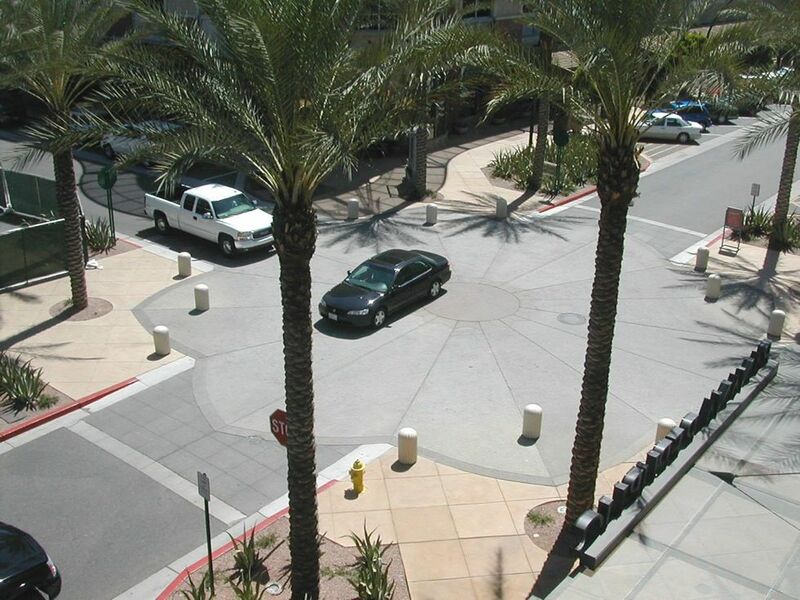 Bollards protect pedestrians from errant vehicles. 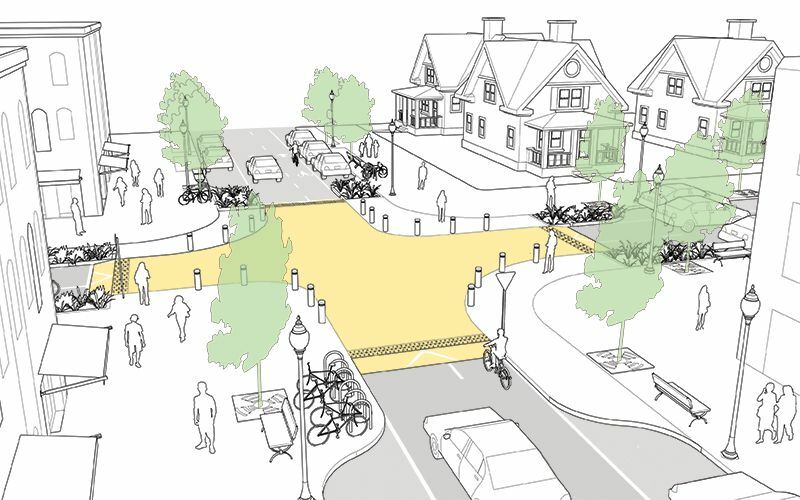 3 Where two 1-way streets intersect, there will be two corners around which no drivers turn. This can be designed with the smallest constructible radius (approximately 2 feet) as long as a 40-foot fire truck can make the turn without encroaching upon the sidewalk. Delaware Department of Transportation. Traffic Calming Manual. Delaware: 2000. Fitzpatrick, Kay, Mark D. Wooldridge, and Joseph D. Blaschke. 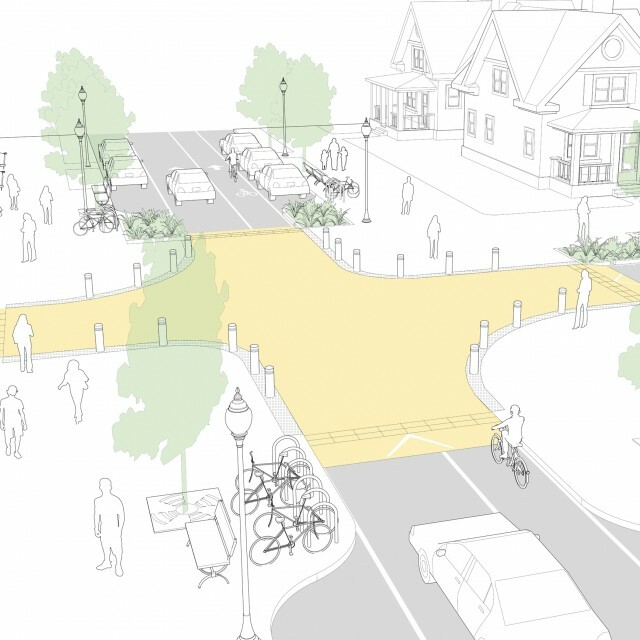 "Urban Intersection Design Guide: Volume 1–Guidelines." Texas Transportation Institute, Texas A&M University System, 2004. King, Michael R., Jon A. Carnegie, and Reid Ewing. 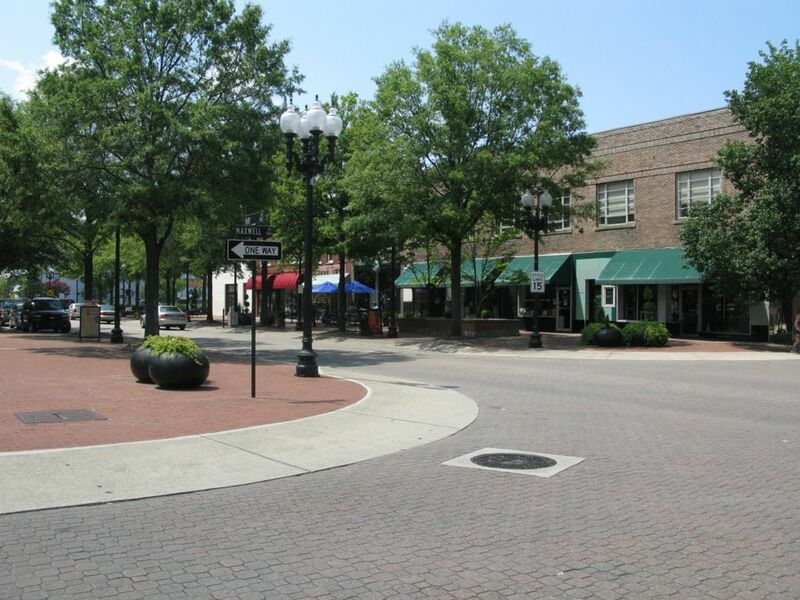 "Pedestrian Safety through a Raised Median and Redesigned Intersections." Transportation Research Record: Journal of the Transportation Research Board 1828 (2003): (1), 56-66. Perkins and Will Consultant Team. 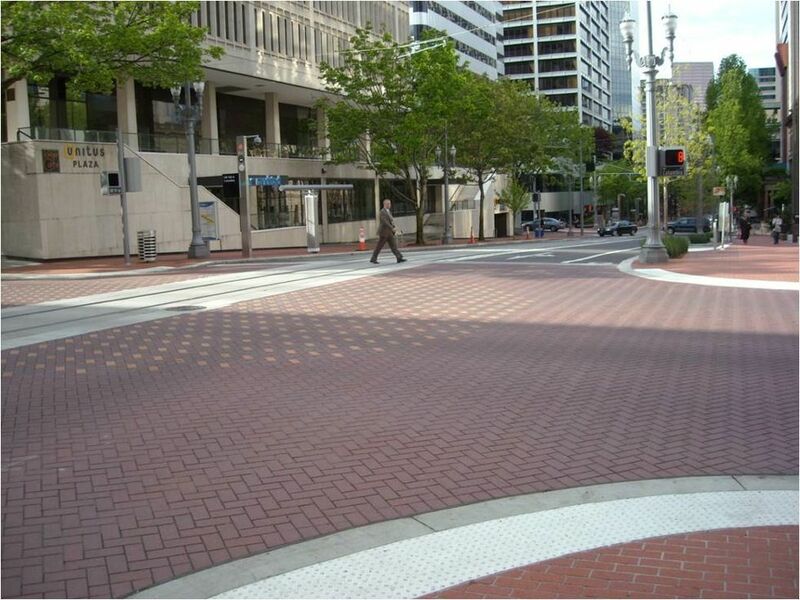 “Pedestrians at Multi-Modal Intersections.” Better Market Street-Existing Conditions & Best Practices, Part Two: Best Practices (2011): 36-58. References for Raised Intersections: 4 found. Perkins+Will Consultant Team. "Pedestrians at Multi-Modal Intersections." etter Market Street Existing Conditions & Best Practices, Part Two: Best Practices 36-58, City & County of San Francisco, San Francisco. King, Michael R, Jon A Carnegie, and Reid Ewing. 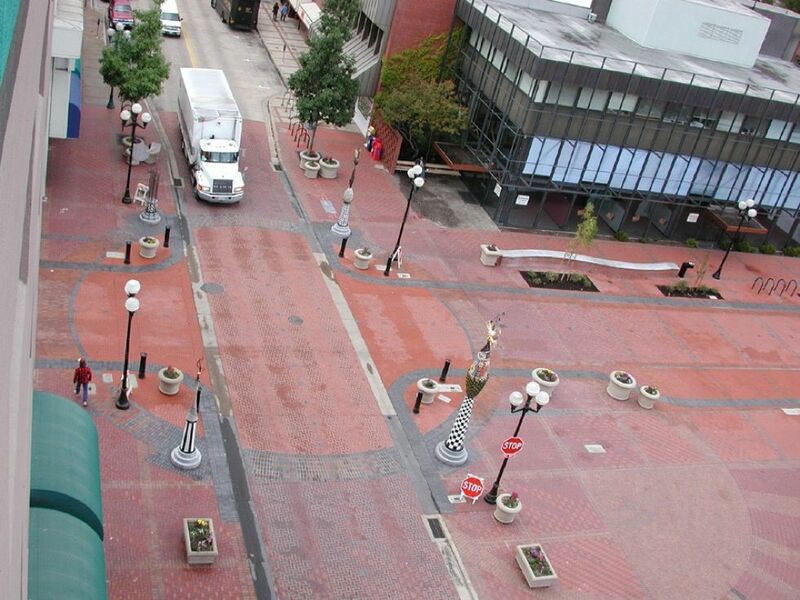 "Pedestrian Safety through a Raised Median and Redesigned Intersections." Journal of the Transportation Research Board 1828 (1), 56-66, Transportation Research Board, Washington, DC. Fitzpatrick, Kay, Mark D Wooldridge, and Joseph D Blaschke. 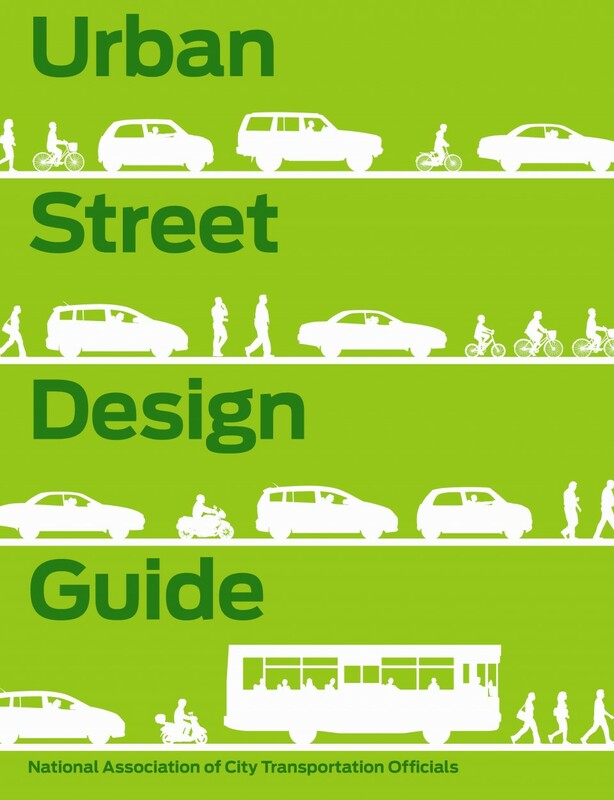 "Urban Intersection Design Guide: Volume 1–Guidelines." Texas Transportation Institute, Texas A&M University System, Texas Department of Transportation, Austin, TX.